Tomorrow is the big day, Roa's meeting with all the therapists and school staff to discuss goals and plan for his transition into preschool. On Monday evening we visited with St. Judes of the Lake preschool and had such a positive experience. The director, Janet, is so nice and welcoming. She is excited for Roa to attend the school and will help acaccommodate for his needs. Roa would have 17 other classmates with two teachers. We will probably pursue a personal care assistant for Roa during school as well. Roa could attend the program 2-3 mornings per week which would work great so that we could continue with Conductive Ed, swimming, craniosacral, private speech, and PT at Courage on his off days OR he could go to the Early Childhood Special Needs classroom. Bryan and I were soooo very grateful that the St. Jude's staff welcomed Roa without hesitation. We were expecting this to be another obstacle to climb. Now we just have to figure things out with the school district. Another positive of the week is that I have been in touch with the staff of Quadriciser (remember the piece of therapy equipment I posted a video of?) and they will be sending us a packet of information. They even offered to pay for our hotel and give tickets to area attractions if we would come and try it out in Knoxville! Not sure if that road trip is in our plans, but it is nice to be so welcomed! Lastly, I have had some email chat time with author and speech therapist, Diane Bahr about Roa's communication development. She was so helpful, supportive and quick to respond to my questions! She even sent me a chapter from her book, Nobody Ever Told Me (or my Mother) That! : Everything from Bottles and Breathing to Healthy Speech Development, to help guide me in Roa's speech development including oral motor ideas. Gotta run, no time to rest.... Little man calls! I guess my title says it all. I'm feeling a bit overwhelmed today. So much to do and plan for Roa. So many goals and activities to work on. So many things he can do now that he couldn't before, yet SO VERY MANY things to work towards. This week is a busy one. Besides our regular therapy routine, we have a our speech evaluation at Functional Kids Therapy Center tomorrow and, to end the week, Roa's team meeting to talk about his transition into school. I can't believe it, but Roa will be heading to preschool in the fall! We are now in the deciding stage of where we will be sending Roa. Before we knew Roa had delays, we planned on sending him to St. Jude of the Lake, our church's school. Now that we have therapists...goals...equipment.... we are not sure we can make that dream happen. I chatted with one of the staff members of St. Jude's and she said that they are not completely handicap accessable. She also didn't know how much one on one support Roa could get. Tonight is St. Jude's Open House and we will be attending to discuss with them the possibilities. Laurie, Roa's OT is so great! Today, she eased my mind a bit and said there is no reason why we couldn't do a combination of Special Needs preschool and St. Jude's. We all just want what is best for Roa. We will make it work. Laurie has been focusing her sessions with Roa on firming up his communication of his knowledge of things. Roa knows so much, but communicating what he knows is difficult given his motor control and speech limitations. Soon, Roa will be tested for school to determine goals and areas of need. I feel, at times, that we have focused so much on motor control, that Roa has had too much "free play" and not enough time following commands. Like any parent, I want Roa to prove to be on top of his game and cognitively "ready". Like any teacher, I have been exposing Roa to colors, letters, numbers since birth. I have used sign language, pictures, and gestures to help him communicate. I have read hims books daily and played matching games. We have painted, cut, colored, and glued. Like any parent, I tried to focus on the fun of these activities. Like any teacher, I focused on skill development during these activities. Roa ADORES his ipad! It has been a LIFESAVER for Mom! When Gunnar needs to nurse and Roa is in need of an activity, the ipad is there. In the stander, highchair, gait trainer, bumbo chair and tray..... the ipad is there. During mealtimes for communication, there it is! There are so many cute FREE or very cheap apps for Roa to use and he can actually play the games and control things ON HIS OWN! Last night while eating his bedtime snack (Daddy's homemade cinnamon apple ice cream, I must add), Roa was watching ABC's Extreme Home Makeover. Did anyone catch it? Well, the cute little guy, named Zoe, got a new Pacer Gait Trainer from the makeover team at the end of the show. You should have seen the look of surprise and joy that spread across Rojo's face as he watched that other little guy moving in a GT!! Wow, someone like me! Roa actually let out a yell of protest when the gait trainer left the program. Both Bryan and I teared up while watching Roa's joy at the gait trainer's moment in the spotlight. How different his little life is going to be. How different he will feel about how he moves around. How limited the exposure to special needs in our society. Why is that? With over 12 % of children in our population of the United States diagnosed with a disability, why don't we see more in the mainstream media? We will do our best to show Roa that he isn't alone. Through You tube clips, community outings for special needs, books, etc., we will show him many differences in how people develop. But to the majority of parents do that for their kids? Parents of kids without special needs? One can only hope. However, judging by the looks of confusion we get as Roa moves through the mall in his "Blue Lightening" GT- I don't think many kids learn to expect OR accept differences in others. Another blogger mom of a special needs child, Marie Claire who writes for her son Ryan on "Peaks and Valleys" posted this and I had to pass it on. 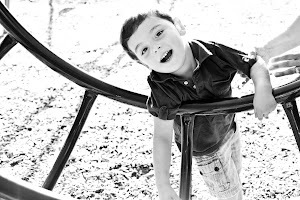 This is a letter from a mother of a child on the autism spectrum to another mother. It is so moving and says it all. Please take the time to read. If tears were dollar bills.... we'd be rich. Yes, the botox is in full affect. Roa is a limp noodle in his gait trainer and angry as a bear! We are all so frustrated with how he is moving in it around the house during our LONG cabin-fever days indoors that I've been driven to tears as well. Today, we took a much needed break from the gait trainer and Roa and Daddy took a trip to Courage for a little pool therapy. I enjoyed a small vacation from King Roa.... he enjoyed Daddy time at his favorite place! We know that with the bad of the botox, comes the good. In a week or two, Roa will figure out how to control those muscles and once again be walking confidently in his trainer.... until then we will do alot of blanket time- rolling, stretching, tummy time, etc. Gunnar enjoys this blanket time with his big brother. He is getting big and smiley! Two months old now. Such a calm and easy baby! What a switch from our first born. Oh the botox,... a blessing and a curse! Now, I am on a mission to find one of these machines near us! If you think you can help me find it, please join the search! Also, check out Exceptional Family TV website! 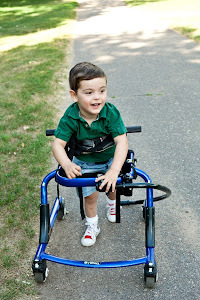 It is such a neat site for families of kids with needs- many resources, topics of discussion. Happy New Year to all. Hope you are off to a positive new start to the year! Roa started off this new year with another round of botox on Monday. He had injections in his adductors, hamstrings, calves, and hip flexors. The latter two areas are new areas treated to see if it can improve his gait further with proper alignment and better stride. We haven't seen much change yet, but hopefully we will see things changing for the better in the next few days. Roa got his new gait trainer- "Blue Lightening", we call it. He LOVES it! It is just like the old one, but a little bigger and blue, but it is heaven to Roa. We kick ourselves if we forget to bring it with no matter where it is we are going. He loves to walk in it AND he is getting very big to carry! 29lbs 33 1/2 inches at his doctor appointment! Roa also got an ipad for Christmas! My great friend from college, Jen Mesko, a rockstar speech therapist from Milwaukee, brought her ipad over during the holidays and did some work with Roa and he took to it right away! It has been so wonderful using it for communicating at meal times. The Yes/No application and it's choice of two options is working well. Roa figured it out right away. He also loves playing a variety of games and preschool apps and it fills up time nicely when I am feeding little Gunnar! I can't believe how well it works for kiddos with limited motor control. Roa is so happy to find success with such a cool new toy! GOD BLESS APPLE! I will post video of him in his gait trainer as well as with his ipad as soon as I can!